All questions about identifying, dating, valuing, buying and selling: please go directly to www.Aronson.nl. -->New The Delft St Luke Guild Book is now online. 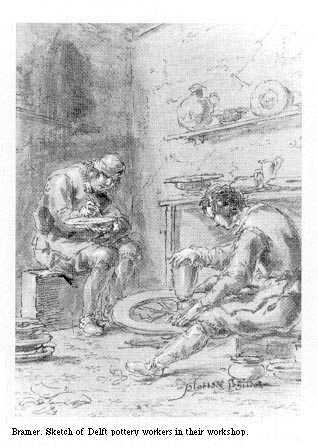 An extensive page on manufacture: How did they make Delft Blue pottery? 1. China (workshop active from 1654 - 1743) Nieuwe, Langendijk, north side; exact spot unknown to me. No further detail in the Delft Municipal Archives 'Names of houses' file, which holds thousands of small index cards written in the 19th and 20th century. 2. De Dissel (workshop active from 1640 - 1702) Molslaan, south side, run by Kruyck and De Cooge. 'Names of houses' file pinpoints this house at the corner of Oosteinde. This defines it as either Molslaan number 183 or 222. 3. De Drie Klokken (workshop active from 1670 - 1841) Geer, west side and Koornmarkt, east side. 'Names of houses' file pinpoints this house at the corner of "Breedsteeg" = Breedstraat at the corner of Korte Geer. This defines it as Geer number 70. 4. De Drie Porceleyne Flessies (workshop active from 1661 - 1777), Gasthuislaan, south side near present day Bastiaanspoort. 'Names of houses' file mentions these in 1692, 1697, 1705. It also mentions the address as Geer, east side. Compare below on this list workshop number 24. 5. Drie Posteleyne Astonne aka Drie Porceleine Astonnen aka Drie Vergulde Astonnekens (workshop active from 1655 - 1804), Lange Geer, east side, a few houses south of Clarenstraat. 'Names of houses' file mentions it as run by Jeronium Pietersz van Kessell, sold 1744 onder the first name; sold again in 1804-1805 under the latter name. 6. De Dubbelde Schenkkan (workshop active from 1660 - 1770), Oude Langendijk, south side. 'Names of houses' file mentions it in 1811 as "Wijk 3, number 414" which is Oude Langendijk number ___ ?. 7. De Eendragt (workshop active from 1808 - 1830), Gasthuislaan, south side, exact spot unknown to me [or was it located at Zuideinde of Oude Delft?]. No further detail in the Delft Archives 'Names of houses' file although another house of this name is mentioned at Zuideinde, north side. 8. 't Fortuyn (workshop active from 1661 - 1784), Lange Geer, east side. 'Names of houses' file pinpoints this house in 1709 as "Geer over 't Magazijn" which may refers to the Oost Indisch Pakhuis (East India Warehouse). 9. Het Gecroond Porceleyn (workshop active from 1645 - 1753), Molslaan, south side. 'Names of houses' file mentions this address in 1706.
l0. 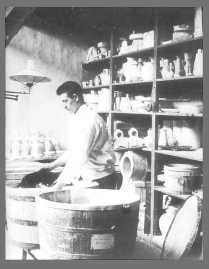 De Gecroonde Theepot (workshop active from 1692 - 1724), Noordeinde, east side. 'Names of houses' file mentions this address in 1753. 11. De Grieksche A (workshop active from 1657 - 1818), Lange Geer, east side. 'Names of houses' file mentions this address in 1602, 1626, 1703 as "Geer bij Achterom / Zuideinde" thus near the southern tip of Oude Delft, probably at number 4 or 6. In 1817 the address is however listed as Koornmarkt, east side. 12. De Ham (workshop active from 1640 - 1726), Achterom. 'Names of houses' file mentions it in 1636 as a brewery and in 1745 as a faience workshop. 13. 't Hart (workshop active from 1678 - 1771), Gasthuislaan, north side. 'Names of houses' file mentions this address in 1698. However, in 1745 the address is given as Zusterlaan, north side. 14. De Hollantse Daalder (workshop active from 1695 - 1721), De Ham, east side [or was it at Kerkstraat?]. 'Names of houses' file mentions a house of this name in Kerkstraat in 1596 as "Bezijden de NK" (besides the New Church). 15. Het Hooge Huys (workshop active from 1650 - 1741), Oosteinde, east side < Another house with this name is mentioned 'Names of houses' file at Oosteinde, east side in 1739. 16. De Klaauw aka De Porseleine Klaauw (workshop active from 1661 - 1840), Koornmarkt, east side, just east of the Oude Gasthuis church. 'Names of houses' file mentions it in 1744 as at the corner of Gasthuissteeg, which defines it as Koornmarkt number 8. 17. De Lampetkan aka De Porseleine Lampetkan (workshop active from 1609 - 1811), Nieuwe Langendijk, south side / Oosteinde, east side. 'Names of houses' file mentions it in 1739 as the south western corner of Nieuwe Langendijk. 18. De Metaale Pot (workshop active from 1670 - 1775) , Geer, east side. 'Names of houses' file mentions it in 1598. 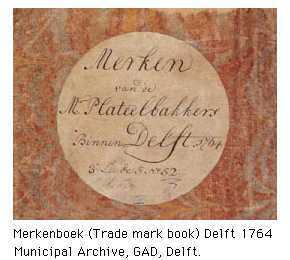 Also listed in 1805 as "Koornmarkt over de Geer" which pinpoints it as Geer number 2 or 4. 19. De Nagtegaal (workshop active from 1633 - 1650), Trompetstraat, north side. 'Names of houses' file mentions it in 1633 as the northeastern corner of Oosterstraat. 20a. Het Moriaanshooft (workshop active from 1690 - 1773), Gasthuislaan, south side. 20b. Het Oude Moriaanshooft (workshop active from 1690 - 1773), Gasthuislaan, south side. 'Names of houses' file mentions it in 1702 "tot de Vest" (near the fortification). 20c. Het Jonge Moriaanshooft (workshop active from 1690 - 1773), Gasthuislaan, south side. 'Names of houses' file mentions it in 1702 and 1706 as "Bij de Vest" (near the fortification). 21. De Paauw (workshop active from 1651 - 1774), Koornmarkt, west side, about 3 houses from Korte Breedsteeg. Mentioned in 'Names of houses' file in 1706 as west side. 22. De Porceleyne Byl (workshop active from 1657 - 1803), Gasthuislaan, south side, near present day Paradijspoort. 'Names of houses' file mentions it in 1690. 23. De Porceleyne Fles (workshop active from 1653 - to the present day ), Oosteinde, west side between Broerhuisstraat and Jan Molslaan. 'Names of houses' file mentions it in 1703 and 1804. Compare above, this list number 4. 24. De Porceleyne Schotel (workshop active from 1598 - 1791), Molslaan, south side, run by Van Goch . 'Names of houses' file mentions it in 1690 as Gekroonde Porseleine Schotel; also lists it in 1704. 25. De Romeyn (workshop active from 1606 - 1774), Achterom, east side. 'Names of houses' file mentions it in 1696 as east side. 26. De Roos (workshop active from 1661 - 1858), Noordeinde, west side, a few houses west of Dirklangensteeg. 'Names of houses' file mentions it a few houses off the corner of Dircklangensteeg (no year). 27. Rouaan known after 1715 as Het Lage Huys (workshop active from 1605 - 1742), Oosteinde, east side. 'Names of houses' file mentions it cryptically as "5e perceel ten N; NW hoek van het matrozenslag". 28. De Twee Scheepjes (workshop active from 1619 - 1794), Molslaan, south side, by the corner of Kruisstraat, run by Keyser. 'Names of houses' file mentions it in 1748 as "vanouds vermaard" (historically famous). 29. De Vergulde Blompot (workshop active from 1616 - 1841), initially at Rietveld, north side and afterwards Molslaan, south side. 'Names of houses' file mentions it in 1671 on the first address and in 1750, 1786, 1804 on the latter address. 30. In de Vergulde Boot (workshop active from 1612 - 1770), Oude Delft, east side. 'Names of houses' file mentions it in 1706. 31. De Vier Romeynse Helden (workshop active from 1581? - 1742), Oosteinde, west side. 'Names of houses' file mentions it in 1738 and 1741 as a famous workshop: "vanouts vermaerde". 32. De Wildemanspoort aka De Twee Wildemannen (workshop active from 1661 - 1788), Broerhuislaan south side, now Burgwal , south side. 'Names of houses' file mentions it as existing after 1572 (!). 33. De Witte Ster also known aka De Witte Starre (workshop active from 1660 - 1804), Oude Delft, west side, near the Rotterdam Gate. 'Names of houses' file mentions it in 1678 as occupying part of the brewery with the same name, just around the corner of Kethelstraat. In 1725 this place was known as a large hotel and stable; in it lived mr. Walterbos who ran the Rotterdam Ferry. 34.? And a lost sheep: De Kunstenaar. Van Aken, Delfts Aardewerk , Waanders, Zwolle part 1, 1999 and part 2, 2001. This source provided the "workshop active" year information. It is the best and most complete study to date. - Exh.Cat. De Stad Delft, Prinsenhof, Delft 1982. - Ach lieve Tijd XV, 750 jaar Delft, de Delftenaren en hun aardewerk , Waanders, Zwolle 1996, p. 352. This list has also been checked against the 19th century and early 20th century card index in the Delft Archive on names of houses "Huizen Delft"
More Delft fine art and pottery has been put online on www.gemeentemusea-delft.nl For online archival information on the Delft archive please click www.archief.delft.nl which offers one of the world's most advanced digital archival search systems, made available free of cost. Enjoy! All questions about identifying, dating, valuing, buying and selling: please go to www.Aronson.nl. Thanks to the Delft Archives Staff for their help and enthusiasm. Research by Kaldenbach. A full presentation is on view at www.xs4all.nl/~kalden/. When visiting Holland, join Private Art Tours. Launched 16 February 2001; update 25 October 2016.